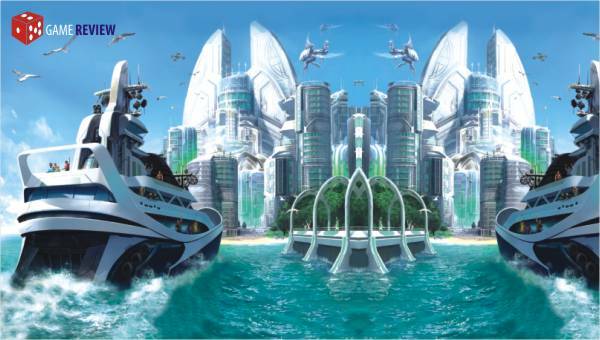 Ubisoft's Anno 2070 is not a typical real-time strategy (RTS) game. Its closest counterpart would be Sim City, but this game is infinitely more complex and brain tickling than the classic city-builder. As the name suggests, the game takes place in the not so distant future - 2070. The Arctic ice caps have all but melted, resulting in a rising sea level that leaves only mountains and other high level areas as the only landmass. Resources are obviously scarce, and world economy is at the brink of collapse. You enter the foray as a manager of one of the three playable factions: The Eden Initiative (referred to as the "Ecos"), The Global Trust (referred to as the "Tycoons"), and the S.A.A.T. (referred to as the "Tech"). Each faction has its own unique characteristics and crisis tackling approach. The Ecos are a band of tree huggers, using limited resources to build sustainable cities that are environmentally friendly; they are also quite slow in expanding and aren't always efficient in their pursuits. The Tycoons are typical industry leaders, using up resources and expanding at a fast rate and asking questions later. The Tech are a faction available to the other two factions, providing support and supplying innovative tech. Micro-management and ability to realise cause and effect are important skills this game requires of the player. There are so many layers and options and layers and some more options that initially, even OCD inflicted people will want to drown in the rising sea level depicted in the game. But if you continue, you'll get used to the array of choices, even welcome it. A balance between collection and use of resources, building and expanding, exploration and defending is necessary. It's not all building and managing, however, as your colony is susceptible to outside attack and you are in charge of the defenses. The combat is straightforward and not much of a challenge to more traditional RTS gamers. The fact that the decisions made in one mission carry over onto the next in campaign/story mode presents the real challenge, as players have to live with bad decisions made previously. The graphics are outstanding for an RTS game. One downside to this are the insane loading times, even on really high end PC's. The movement and general commands also feel a little sluggish if graphics settings are turned all the way up. The soundtrack is quite good, not memorable, but fitting nonetheless. The story is not something one would get hooked on easily, but the gameplay and the satisfaction received when you manage to do something right is what will keep most players interested. This is not a light, fun game. It's more like Al Gore's The Inconvenient Truth. If you are a tree hugging hippie with yearnings for a guilt trip filled gaming experience, this game is for you. If you like being bossy as hell and feel the need to micro-manage everything, this game is for you. Wannabe dictators should stay away however, this game doesn't have the lavish sort of lifestyle a dictator should have. RATINGS: GAMEPLAY: 8.5/10; GRAPHICS/SOUND: 8/10; STORY: 7/10; OVERALL: 8/10. "WARRIOR” is a movie which brings together aspects of family, love and the passion for fighting into a heart-breaking masterpiece. The Academy Award nominated movie started a buzz amongst people even before its release in September 2011. 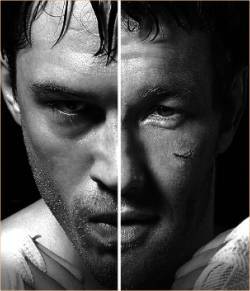 The story separately portrays the lives of two brothers: Brendan Conlon (Joel Edgerton) and Tommy Conlon (Tom Hardy) fourteen years after they left their abusive alcoholic father's home. Tommy, a reserved and bitter Marine, visits his father Paddy Conlon (Nick Nolte) to see that he had given up his past habits and converted to Christianity. Tommy seeks his help to train for the SPARTA, the biggest mixed martial arts tournament in history. On the other side, Brendan is a high school physics teacher, married with two kids. His family was facing huge financial crisis and he decided to wrestle in a small parking-lot fight and win some money for his family. When the school heard of this, though, they suspended him and without a choice, Brendan turned to his friend, Frank, to train him for the SPARTA. Rising actor Tom Hardy's brilliant acting as Tommy, a brawny man bulldozing his way through life is especially captivating. And Edgerton plays the more emotional older brother. These actors take their roles far beyond any stereotypes. Nolte plays the father very well and was nominated for an Academy Award for best supporting role. The thing about this movie is that it blasts our ideas of these buffed wrestlers always being macho. It also shows all these stories in such a touching way, that you can't help but feel emotional. The movie did very well amongst critics, with 85% positive reviews. Warrior suffers from some clichés and seems to fall under the shadow of The Fighter, its more famed counterpart. But what sets it apart is the direct rivalry between the brothers who go head to head in a caged arena. The Fighter (2010): A biographical story about welterweight boxer Micky Ward and his rise to championship, with brilliant acting by Christian Bale as his addicted brother. Cinderella Man (2005): Also a biographical story, based on the life of James Braddock, a washed up boxer who came back to become a champion and the inspiration of a nation during the Great Depression. 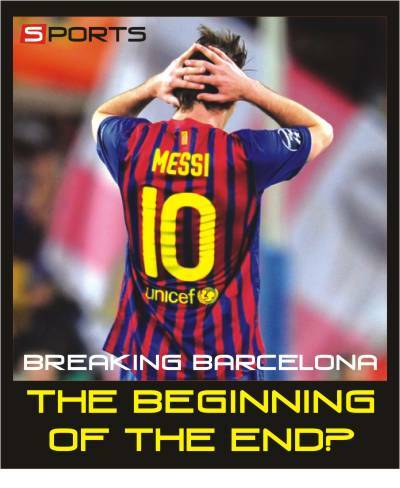 Anyone who knows anything about the world of football knows that Barca has been the team to beat the last 4-5 seasons. They were an irresistible force and could sweep away opponents with ease. Beating the likes of United 3-1 and Real 5-0, there were people fearing that football might not be fun anymore since games against Barca were often a foregone conclusion. The most notable thing about Barcelona in the last four years (under Guardiola) has not been the 13 trophies they'd won (which includes three La Liga titles and two Champions Leagues), but the way they had done it. Their possession football has left sides flabbergasted and frustrated. Teams had no answer to their game. Inter Milan has done it before, but most people simply put it down to Mourinho's tactical genius and a fair bit of luck. But even the highly successful Mourinho was humbled soon afterwards as his Real side took the 5-0 thrashing at the hands of the Catalans. Manchester United tried to beat Barca in their own game and ended up losing 2-0 and a couple of years later, 3-1. How does one beat Barca? Recently, we saw Chelsea beat them over the two legs and we saw Real beat them in the La Liga. Barcelona still dominated possession but they couldn't crack Chelsea's defense. And most would argue this was a weaker Chelsea side than the one which came so close to beating Barcelona in 2009. What Chelsea did was simple. They sacrificed space on the wings and made sure those tiny pockets of spaces don't appear in their defense for Barcelona to exploit. Normally, that's something criminal for a defense because that would mean wingers get the time and space to put in decent crosses and crosses can get tricky to defend. But they knew Barca wouldn't put crosses into the box. Aerial balls would almost always be won by Chelsea and it would mean sacrificing possession and Barca don't like that. Whenever they lose the ball, they work really hard to get it back. Possession football is only good when you have majority of the possession but if you keep losing possession, you would be tiring yourself out by chasing the ball every now and then. Chelsea let Barcelona pass the ball just outside their penalty area this past semi-final and made sure they were organised. They needed a bit of luck and fortune favoured them. But it does not take anything away from the fact that it was a remarkable achievement, sneaking in goals while keeping Barca at bay. Real did it too. They kept their shape and counter attacked. Before Chelsea and Real, Milan almost got it right. Milan's defense was like a piece of wood floating in the water. They would shift their defense to the side where Barca had the ball. This would leave huge spaces on the other wing for the fullbacks to attack. But Milan would let the fullbacks have their way and made sure players like Messi and Iniesta were not given any space on or off the ball. And Barca hated it. So, are teams learning how to play against Barcelona? Maybe. Football is an ever evolving game. Just as teams have adapted to playing against Barcelona, Barcelona might yet adapt to the anti-Barcelona tactics. But this will definitely be tough without the guiding hand of Guardiola. Will Barca pull it together? It remains to be seen. But while we wait, let's see who takes home the cup this year. AWKWARD is MTV's take on the perils of being in high school. The show moves along the lines of Mean Girls, Skins or the more recent Suburgatory, but with a few unfamiliar twists it stands out. Jenna is just an average fifteen year old with an extremely liberal mom (who encourages cosmetic surgery to a point of being crazy) and all she wants from high school is to pass it as inconspicuously as possible. Blending in is the name of the game because the whole school and the school bully Sadie's attention seems to be focused on a single person: Jenna; because they think she tried to kill herself. She tries to survive mountainous unwanted attention with the help of her best friends Tamara and Ming, the former being a redhead who constantly seeks attention and the latter always grounded by her Chinese parents to do homework (nope, not stereotypical at all). In between being the subject of Sadie's terrible jokes and talking in internet acronyms that even we had trouble deciphering, Jenna tries her luck with the school hottie Matty McKebben. 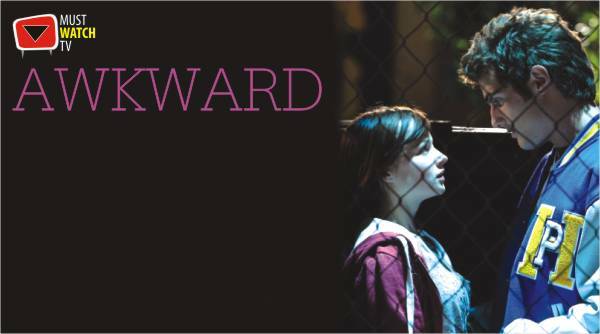 Awkward's first season was released in 2011 and with 12 episodes the show is economical, bandwidth-wise. The acting is somewhat below average, in some cases a bit cringe worthy. The Jenna character's voice and Tamara's conversations are quite annoying, to be frank. If you manage to tune out the bad, the rest is surprisingly good. The show is solid in terms of the characterisation. The bully has more to her than just being horribly mean [she's fighting a weight problem] the hot guy is not just a face [he's actually a nice guy who likes Jenna] and even the parents while being crazy are quite endearing. The music is good and they show the name of each song playing in the show, which is nice. Even though it plays into the same old type of story and characters it has a new take on them and that is where the merit of Awkward lies and you guys should give it a chance.